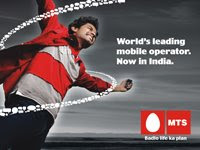 MTS India launched a new plan named 'One MTS One India'. This new plan offers subscribers local and STD calls within MTS network for a tariff of 35 paise per minute or a voucher priced at Rs.11. The voucher to be made available for a period of 12 months will come with validity period of one month. This Voucher will be available both on paper and easy Recharge.